There is an idealistic innocence in childhood, one that makes us all believe in our youth that anything is possible. But, as 1 Corinthians 13:11 aptly notes, “When I was a child, I spake as a child, I understood as a child, I thought as a child: but when I became a man, I put away childish things”. Or, in other words, each person experiences this loss of innocence as reality infringes on their lives. And it was perhaps this concept that guided Brazilian artist Igor Ventura to begin his The Death of Innocence sculptural series in 2014. “I remember exactly where I was when inspiration struck me and I had the idea of a rocking horse Dunny“, says Ventura, referring to his original handmade work using Kidrobot’s rabbit-eared form at its base. “I was on my way to work with my wife on a Monday morning”, he continues, “trying to imagine different ways to do something with the Dunny shape. I tried to think about my childhood experiences, and remembered a little toy I loved when I was really young: a wooden rocking horse”. Immediately recognizing the potential in the interpretation, Ventura “realized I needed something more, something different, something not so literal”. Inspiration struck the artist when, according to him, he “realized that when you grow up, some of the things that you took for certain when you were a child die. You find out that the world isn’t fair, that your parents aren’t always right, that growing up is hard… so a dead rocking horse would represent really well when your innocence dies”. 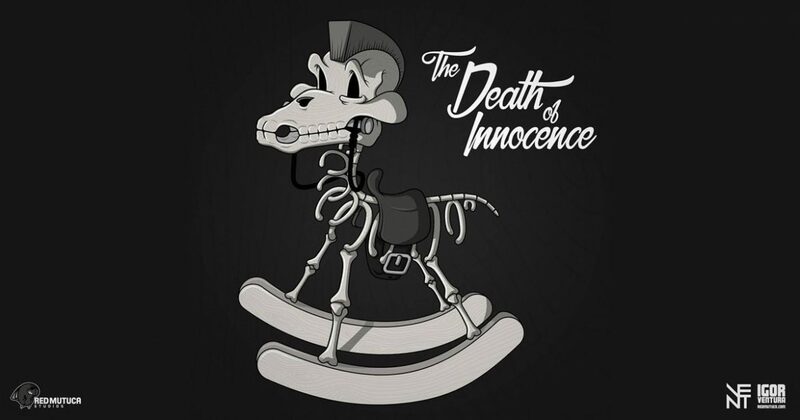 Given “total creative freedom” by a collector that commissioned a work from him, Ventura carefully shaped the original roughly 3-inch tall The Death of Innocence piece, which would become a finalist in the 5th annual Designer Toy Awards. By the end of Summer 2015, Ventura had handmade a further three unique versions of The Death of Innocence. Emphasizing the abandoned nature of the concept, the green mold spot adorned Decayed rendition was made, according to Ventura, for a “collector from the UK had seen the original” and commissioned one of his own. Similarly, artist Jon-Paul Kaiser “got in touch and said he wanted one”, Ventura recalls, for which the bleached and faded appearance of the Whitewood version was created in a trade of original art pieces. And the glossy brightness of the Redwood variation was one that Ventura created and “kept for myself”. Following the critical success of and positive response to The Death of Innocence, Ventura remembers that he “submitted a production project to Kidrobot for a 3-inch version in October of 2015″, to which the company’s Chief Creative Officer, Frank Kozik, “replied saying that he loved it and would check if it was possible to make it in real wood and leather”. And while he waited for updates on this, the artist made his fourth rendition of the concept in 2015. The “collector that commissioned me to make the original piece”, says Ventura, “wanted something bigger, so I created the Dia de Los Muertos edition”. Standing roughly 8-inches tall, this unique piece was based on the collector’s “suggestion of a theme”, its hand-painted decorations modeled after the ornate calavera associated with the Mexican celebration of the Day of the Dead (Día de Muertos). Marking Ventura’s first factory-made 8-inch tall Dunny form, the artist feared that “it would be difficult to perfectly align a complex wood vein pattern if it was painted”. Thankfully, Kidrobot had “said I had total freedom”, Ventura recalls, “so I decided to have it sculpted onto the figure, and asked for a weathering effect that could accentuate those veins and all the sculpted features, giving it a more aged/vintage toy look”. A tactilely alluring form, these limited edition vinyl sculptures are capable of truly rocking back-and-forth, balanced to inherently do so when placed down, the soothing motion of these kinetic art pieces pleasing to the eye. Issued in the brightly patterned Dia de Los Muertos 900 piece edition, the strikingly colored Redwood 200 piece edition exclusive to Kidrobot.com, and the stark Whitewood 100 piece edition exclusive to select retailers, these The Death of Innocence works are a perfect way for art collectors to maturely display a remembrance of the childish things they left behind. Click Here to Acquire Igor Ventura’s The Death of Innocence Dunny from Kidrobot, or Click Here to Find a Kidrobot Retailer to Order it from.